I am a 42-year-old mother of five sons – my eldest is aged 14 years and my youngest, who are twins, are eight years old. 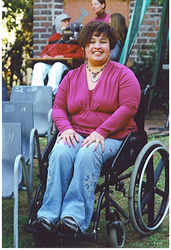 I was involved in the Kloofnek bus accident in August 2005. I was a volunteer mother who accompanied my twelve-year-old son’s grade seven schoolmates on an outing up the mountain in the cable car. On the way back home, the accident occurred which rendered me temporarily disabled – thankfully my son suffered minor injuries. I sustained spinal injuries but since my injury is incomplete, I have learned to walk with the aid of a walking frame. When I get stronger, I’ll progress onto crutches. I spent nearly four months at the Western Cape Rehabilitation Centre and went through a range of emotions. What I ultimately realise, though, is that whatever renders you physically disabled is a life defining moment – but it does not have to define your life. You might be wheelchair bound and have physical limitations but there is no limit to what you can achieve with a positive attitude and approach to life! We watched a video at the rehabilitation centre one day where a paraplegic said that eighty percent of your disability is in your head. In other words, if you think you are disabled, you are! Now I can just imagine what you paraplegics and quadriplegics out there are thinking: “Yeah right! That’s easy for you to say – you can walk!” Believe me, I experience the same difficulties and frustrations as you. At the moment a large part of my life is spent in a wheelchair as I am still very unsteady on my legs and can only manage to walk short distances with the walking frame. I use it only at home for short periods but when I’m out and about, I have to use my chair. Also, learning to walk again has it’s own challenges (I don’t like using the word “complications”). I have lower backache, my knee joints hurt and my left foot has dropped so I can’t distribute my weight evenly, and that causes problems. I am not looking at life through rose coloured spectacles – there are negatives, but I refuse to dwell on them! I have discovered that an accident disables your body, but self-pity disables your mind, emotions and most of all your spirit! This robs you of living a fulfilled life. I refuse to imprison myself in a dungeon of despair and miss out on the life lessons I am supposed to learn through this experience. The one thing I appreciate about this situation is that I have a whole new perspective on many aspects of life. I appreciate my husband and my sons in a whole new way. I appreciate life on a whole new level because I came so close to death. Oh sure, there are days when I think: “God, I could have done without this in my life! I have five sons to raise and now have to do it with physical limitations!” But ultimately I know that God loves me and He has my best interest at heart and, most of all, my life was spared for a purpose! I believe that if your life has a purpose, then nothing happens to you that cannot work for you! I heard a very profound quote recently that says: “The difficult things in life are intended to make you better, not bitter.” So don’t let your disability define who you are – live your best life and strive towards becoming a master of your destiny, not a victim of your history!